Special thanks to the Regional Arts Commission, and its donors, for their financial support towards the development of this body of work and upcoming 4k stereoscopic animations. 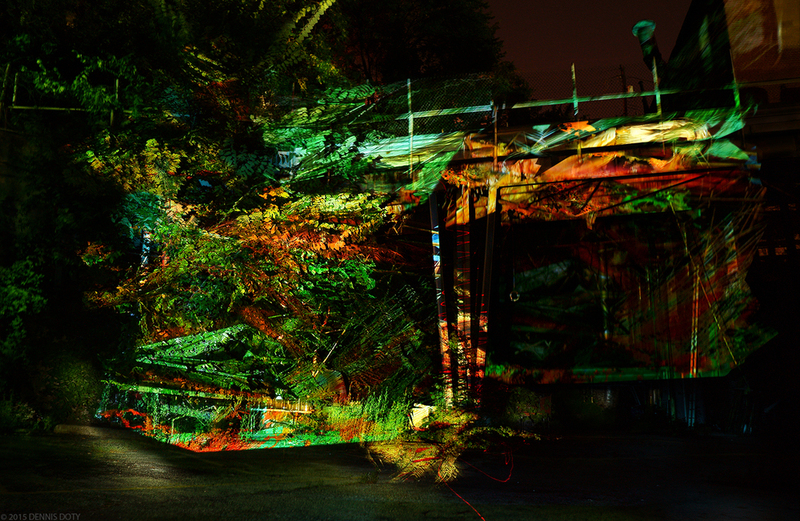 These images combine historic architecture from St. Louis with projected imaging technologies. During the evening, a video projector is used to fill a location with massive images, transforming the space. I then take long exposure photographs to document the work. As I shoot the photos, I use colored flashlights, like a paint brush, to create large scale gestural marks. Another tool I use is a modified paintbrush, I removed the bristles and then replaced them with four lasers; the resulting mark is a series of crisp lines. Together, these tools and processes lead to dynamic compositions that combine historical architecture with modern digital technologies.